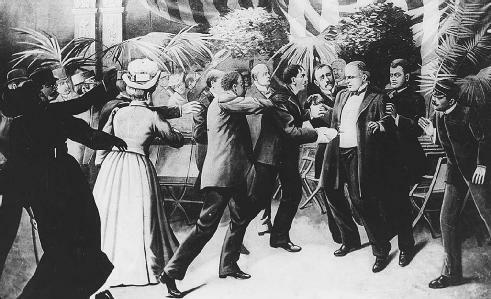 President William McKinley was shot by Leon F. Czolgosz, on September 6, 1901, at the Pan-American Exposition in Buffalo, New York. McKinley died on September 14. Murder committed by a perpetrator without the personal provocation of the victim, who is usually a government official. First used in medieval times to describe the murders of prominent Christians by the Hashshashin, a secret Islamic sect, the word assassination is used in the twenty-first century to describe murders committed for political reasons, especially against government officials. Assassination may be used as a political weapon by a state as well as by an individual; it may be directed at the establishment or used by it. The term assassination is generally applied only to political murders—in the United States, most commonly to attempts on the life of the president. However, the classification of any one incident as an assassination may be in part a matter of perception. The "assassination" of the outlaw Jesse James, in 1882, provides an example of the difficulties. Thomas T. Crittenden, governor of Missouri, assumed that being seen as responsible for the death of the notorious outlaw would be good for his political career. For this reason, Crittenden granted each of the killers a pardon in addition to a $10,000 reward. But the American public spoke vehemently against James's killers, dubbing them assassins and his death an assassination. Crittenden was vilified by the American people, and his political career was destroyed. It is not always easy to guess the motivations of those who attempt assassinations or to understand the historical and legal implications of their actions. The anti-constitutional nature of assassination has made it a focal point for conspiracies and conspiracy theories from the beginning. The first attempt at the assassination of a U.S. president was Richard Lawrence's attack on Andrew Jackson in 1835. Although a jury acquitted Lawrence on the ground of insanity, Jackson was convinced that the attack was part of a Whig Party conspiracy. The 1865 assassination of President Abraham Lincoln by John Wilkes Booth prompted its own set of theories. In a controversial decision, a military tribunal convicted nine people of conspiring in Lincoln's assassination. In the case of one of those hanged for the crime, Mary E. Surratt, all that could be proved was that she owned the rooming house in which the conspirators plotted. Nonetheless, high emotions at the end of the Civil War resulted in her execution. After sentiments cooled and talk of conspiracies calmed, the two surviving conspirators imprisoned for Lincoln's death gained pardons from President Andrew Johnson. Even greater controversy was caused when the public was deprived of the opportunity to see Lee Harvey Oswald tried for the assassination, in 1963, of President john f. kennedy. Oswald's death at the hands of Jack Ruby sparked theories of conspiracy that ranged from Communist plots to Mafia hits to cover-ups by U.S. officials. President lyndon b. johnson appointed a group of national figures, led by Supreme Court Chief Justice Earl Warren, to investigate the assassination and issue a report. The Warren Commission concluded that Oswald had acted alone. Despite this, conspiracy theories remained widespread in books and in films like Oliver Stone's JFK: The Untold Story (released in 1991). In an attempt to calm public suspicions surrounding the Kennedy assassination, the President John F. Kennedy Assassination Records Collection Act of 1992 (44 U.S.C.A. § 2107) was passed by Congress. The act released much of the Kennedy assassination material in government files. As of 2003, its effectiveness at stilling concern over a possible conspiracy remained to be seen. It has become clear that the public demands a thorough investigation of any attempt on a president's life. Because it is a crime to advocate the assassination of any U.S. president, even threats are carefully investigated. In U.S. history, four presidents have lost their lives to assassins: Abraham Lincoln, james garfield, William McKinley, and John F. Kennedy. In 1974 the Congress established a committee to investigate possible U.S. involvement in plots to assassinate foreign leaders deemed hostile to U.S. interests. Specifically, the committee investigated the alleged involvement of the Central Intelligence Agency (CIA) in plots to kill Patrice Lumumba of the Congo, Fidel Castro of Cuba, Rafael Trujillo of the Dominican Republic, General Rene Schneider of Chile, and Ngo Dinh Diem of South Vietnam. The absence of a written record and the failing memories of principal witnesses prevented the committee from conclusively demonstrating that presidents Eisenhower, Kennedy, or Nixon personally authorized the assassination of any foreign leader. However, the evidence did show that between 1960 and 1970, the CIA was involved in several assassination plots. The committee reported its findings in 1975 to a dismayed Congress. Public outcry was loud and immediate. At the urging of both the House of Representatives and the Senate, President gerald r. ford signed an Executive Order banning all federal employees from committing assassination as a tool of U.S foreign policy or for any other reason. Exec. Order No. 11905. The order was extended by President ronald reagan 15 years later to also preclude hired assassins. Since the September 11, 2001, terrorist attacks in New York City and Washington, D.C., Congress and the White House have been revisiting the propriety of political assassinations committed by members of the U.S. government. In December 2002, according to a Globe and Mail news story, President george w. bush gave the CIA written authority to kill about two dozen terrorist leaders if capturing them proved to be impractical and civilian casualties could not be minimized. The CIA relied on that authority in using a pilotless Predator aircraft to fire a Hellfire antitank missile at a car in Yemen carrying an al-Qaeda operative. The al-Qaeda operative and five other people died in the attack. Allen Chair Symposium 2002. 2003. "Political Assassination as an Instrument of National Policy: An Inquiry into Operations, Expediency, Morality, and Law." Univ. of Richmond Law Review (March). Donoghue, Mary Agnes. 1975. Assassination: Murder in Politics. Chatsworth, Calif.: Major Books. Harder, Tyler J. 2002. "Time to Repeal the Assassination Ban of Executive Order 12,333: A Small Step in Clarifying Current Law." Military Law Review 172 (June). McKinley, James. 1977. Assassination in America. New York: Harper & Row. Taylor, Stuart, Jr. 1998. "Assassination as Self-defense." New York Law Journal (November 30). Lincoln, Abraham, "Lincoln Assassination Conspiracy" (In Focus). Al-Bth Party Regional Leadership condemns assassination of Brahmi The Regional Leadership of al-Bth Arab Socialist Party denounced in a the assassination of Mohammad Brahmi, affirming that such cowardly acts won't dissuade honest and patriotic people from continuing to confront hatred and extremism. Ennahdha movement Secretary-General Hamadi Jebali asserted that the assassination of Mohamed Brahmi is a serious crime by its coincidence with the celebration of the Republic Day. While prime minister, Euzal survived an assassination attempt by a right-wing gunman in 1988. Earlier, two senior policemen on security duty at the site of the assassination told investigators they were in direct touch with Musharraf on the day Bhutto died. To this very day I refuse to accept that a politician from Macedonia is behind the assassination attempt for some benefits. Nasrallah said they have also just learned of an Israeli spy who had been scouting the area of the assassination just a day before the truck bomb that killed Hariri exploded. Also, the Pakistani police deliberately failed to conduct a serious investigation into the assassination because it feared that the intelligence agencies were involved. Democratic institutions," they conclude, "thus appear robust to the assassination of leaders, while autocratic regimes are not. 8 following the violence triggered by the assassination. Russia denies that it had anything to do with the assassination, and Putin has pledged Russia's full cooperation in the investigation. Steven Spielberg's study of an assassination team out to avenge the terrorist murders of Israeli athletes at the 1972 Munich Olympics will likely take multiple viewings over years to fully and fairly assess as either a work of art or a political/morality play. Most people cringe when they hear the word assassination (1) because it reminds them of some of the most tragic events in American history.